Our first check from Amazon! Lloyd's Steamboat Directory and Disasters on the Western Waters was first published in 1856. The new edition, by Land Yacht Press, includes a new introduction and an overview of steamboating during Lloyd's time. We asked the publisher, Jay Richiuso, why he chose to reprint Lloyd's disaster directory and he said, "By profession I'm an archivist and a historian. I started Land Yacht Press to publish new history books, and to reprint out of print books that should be back in print. As for Lloyd's Directory, I work with a couple of guys who are interested in steamboating and they brought it to my attention, knowing that I'm interested in reprinting/republishing good books that are out of print. I tracked down a copy and here we are." This is a must-read for anyone who loves steamboats. It's an excellent companion to Fred Way's Packet Directory because you can look up boats that have sunk and find out why, how and where it happened. The list price is $25 (US) plus $3.50 for priority shipping and handling (Tennessee residents should add 8.25% sales tax), for a total of $28.50. Send checks or money orders to Land Yacht Press, P. O. Box 210262, Nashville, Tn 37221-0262 or order it now through Amazon.com. By 1838, over two thousand Americans had been killed and many hundreds injured by exploding steam engines on steamboats. After calls for a solution in two State of the Union addresses, a Senate Select Committee met to consider an investigative report from the Franklin Institute of Philadelphia, the first federally funded investigation into a technical catastrophe. Although the investigation report was well written by the top scientists of the day, and the authors included an effective bill to correct the technical problems of steam engines and stop the fatalities and injuries, the bill was drawn up with a key segment X-ed out. As a result, the wrong piece of legislation was passed by the House and Senate and signed into law by President Van Buren as the United States' first piece of interstate commerce legislation. The explosions and deaths aboard steamboats continued for another fourteen years before corrective legislation was passed. Exploding Steamboats investigates the rhetoric, politics, and technology of antebellum America, offering timeless insights into the nature of writing, reading, and public control of technology. 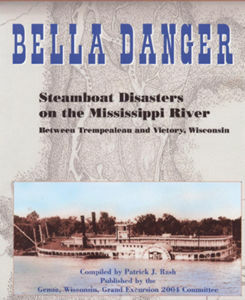 A 23 page booklet with information on 31 sunken steamboat on the Mississippi River between Trempealeau, WI and Victory, WI. Booklet contains many photos, aeriel photos, and maps. Cost $10 for booklet plus $1.50 postage (U.S.). Poster: Shows location of 31 steamboat sinkings on Mississippi River between Trempealeau, WI and Victory, WI (many boats were recovered and refitted). Poster 17" x 22". Contains photos of War Eagle and steamer Reindeer. Cost $8 for poster plus $3.50 postage (U.S.). Also, order a postcard commemorating the Grand Excursion, to be held June 25 - July 5 on the Mississippi River (click here for more info.). The postcard depicts the War Eagle, a boat that participated in the original Grand Excursion, plus the Mississippi Queen, which will participate in this year's event. Send $1, includes postage. For fifteen days in September, 1857, the attention of both the United States and Europe turned to a rundown Chicago courtroom. The steamboat Effie Afton had crashed into a pier of the first railroad bridge thrown across the Mississippi River at Rock Island, Illinois. The controversial lawsuit that followed promised to change the economy and the social fabric of the vast Mississippi River Valley. Some of the sharpest legal minds practicing in what was called at that time the Far West tried the test case. One of those lawyers was Abraham Lincoln. Hell Gate of the Mississippi puts you in the jury box for an up-close, firsthand look at this highly charged trial. The book includes a history of steamboat explosions, including how it all started. 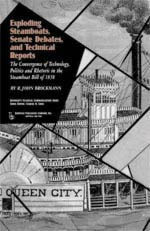 The government attempted to regulate steam engines, but they continued to blow up regularly until 1911 when Massachusetts established uniform boiler safety rules, which set the industry standard. 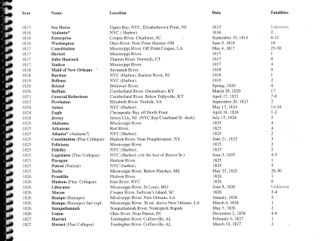 The book lists the worst explosions, explosions by year, and the names of boats, locations where disasters happened, and numbers of fatalities. 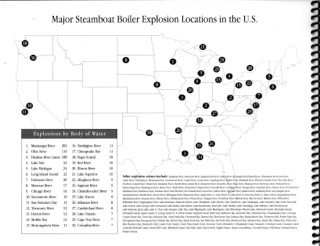 Spoiler alert: since 1920 there have been fewer than twenty steamboat boiler explosions. Contact the author to order a copy: jcanavit[at]satx.rr.com. $12. Find out why the steamboats are bent on destroying civilization as we know it and how a select Senate committee tried to stop them. This is part of Baywood Publishing Company, Inc.'s Technical Communications Series. 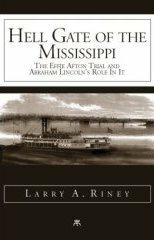 To read more about this title, go to Amazon or to Baywood Publishing Company, Inc.
Steamboat Arabia Museum Museum in Kansas City, MO, displays recovered artifacts from this steamboat that sank in the Mississippi River in 1856. 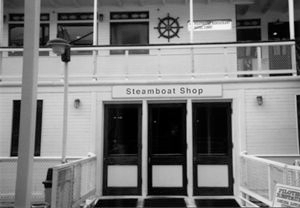 Steamboating Accidents Virginia.edu essay on steamboat accidents: "The age of the steamboat introduced an era of unprecedented speed into the American consciousness."